Archaeological Prospection is a fascinating discipline using High-Tech instrumentation for the non-destructive localisation and documentation of archaeological sites and monuments. 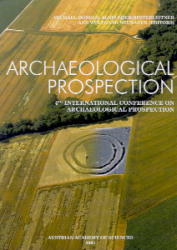 The book of abstracts of the fourth international conference on Archaeological Prospection held in Vienna in 2001 provides an overview over state of the art methodology, techniques and applications from all over the world. Satellite imagery, airborne remote sensing and aerial archaeology as well as geophysical prospecting (magnetics, resistivity survey, ground penetrating radar etc.) help the archaeologist to monitor and search whole landscapes, to detect new sites and to map their inner details with high accuracy. The prospection data is used for visualisations of our archaeological heritage buried in the ground. New spectacular prospection results including recently detected Chinese imperial palace sites, new insights into the surroundings of Egyptian pyramids and towns, Roman towns and villas and mysterious circular ditch systems from the Neolithic are reported by the world’s leading prospecting archaeologists and geophysicists.